25% of all dogs will develop arthritis or joint ailments of some kind. K-9 Glucosamine contains essential nutrients that have been shown in clinical studies to prevent and dramatically improve the condition of animals suffering from joint ailments. For younger dogs, Glucosamine and Chondroitin aid in the prevention of arthritis while MSM promotes general good health. Supplements in a liquid form are shown to absorb more quickly & efficiently than tablets, offering faster results. Liquid Health, develops the highest quality pet supplement products at the lowest possible price. Founded in 1991, Liquid Health immediately filled a niche in the market with Daily Multiple. Although the product—a sea vegetation blend with aloe and honey—was not revolutionary, its appearance in the retail market (as opposed to a multi-level market) was a new idea. Because it has been marketed to independent stores nationwide, Daily Multiple has developed a loyal following. Building on this success, Liquid Health has continued to introduce high-quality products by drawing on the knowledge of experts in the health food industry nationwide. 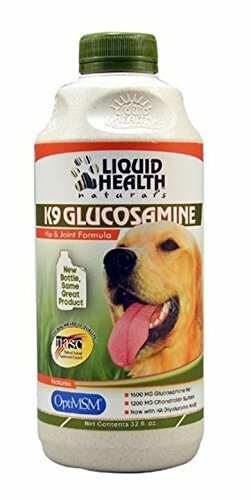 K9 Vegetarian Glucosamine (formerly K9 Glucosamine & HA) by Liquid Health - 32 oz. GLOWING, VIBRANT, OPTIMUM HEALTH FOR YOUR DOG Our comprehensive balanced formula will provide nutritional support for dogs of all ages. Maintaining your dogs health in the early stages of life can prevent costly visits to your vet. Dog's need assistance when they are growing and developing, during pregnancy, periods of illness, as they age or maintaining their health through life's ups and downs. Feeding your dog a balanced diet and with daily exercise your dog will enjoy the best possible health for a long and happy life. WHY YOUR DOG NEEDS A MULTI-VITAMIN * Maintaining daily health. * Feeding a home made diet, will lack essential vitamins & nutrients. 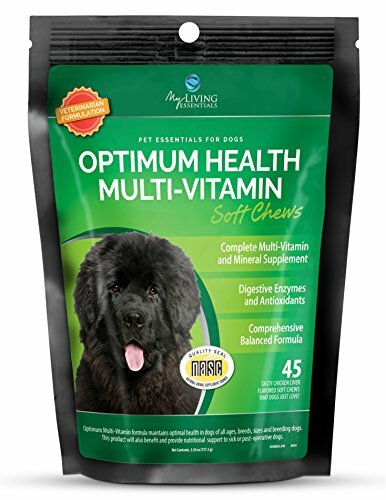 * Nursing or breeding dogs will have increased nutritional requirements. * All post operative dogs will need an extra boost to their immune system and to support them with the healing process. * Working and performance dogs need to cope with greater physical stress. Their bodies are constantly undergoing repair. * Aging pets receive the largest benefits. They need extra support to preserve their health, skin & coat condition, digestion, increase their comfort, boost their immune system and improve their quality of life. GIVE YOUR DOG THE GIFT OF PERFECT HEALTH Our Tasty Chicken Liver Flavored Soft Chews will give your best friend a healthy treat to start the day and they won't even notice how good they are. Our customers and their dogs will agree. THATS OUR PROMISE! K9 Glucosamine for dogs with chondroitin is a liquid joint supplement for dogs to help keep them healthy and active. Nearly 25% of all dogs will develop some type of joint mobility issues over their lifetime. For younger dogs, glucosamine and chondroitin are easily absorbed and may stimulate the production of proteoglycans, which help maintain the health and resiliency of joints and connective tissues. MSM promotes general good health. Supplements in a liquid form are shown to absorb more quickly & efficiently than tablets, offering faster results. 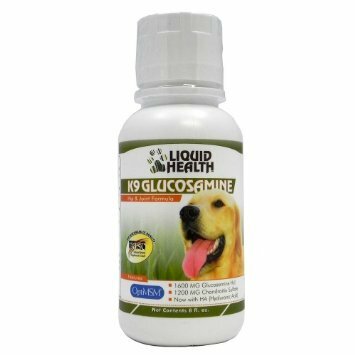 Liquid Health's K9 Glucosamine for dogs with chondroitin has received praise from old and young dog owners alike! 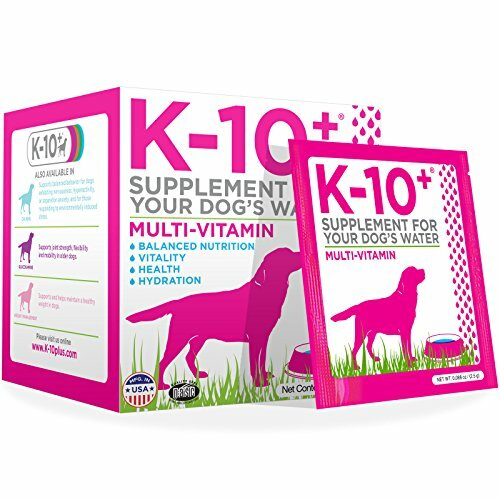 K-10+ Multi-Vitamin for dogs is specially designed to enhance and support general immunity, health, strength, proper growth and hydration. Every packet of K-10+ provides ten-plus essential vitamins, minerals and electrolytes. Tear open and pour the contents of the packet into your dog's water bowl or bottle, then simply add water. A slight color shift will occur which always lets you know the vitamins are present and active in the water. K-10+ was designed to be virtually odorless and tasteless. One box of K-10+ is good for a one to two month supply depending on the size of the dog. All K-10+ products are proudly made in the USA with only the finest quality human grade ingredients.